We went a bit crazy on this one. 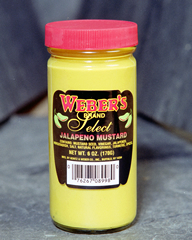 A fresh tasting, spicy mustard blended with Jalapeno powder and bits of diced Jalapeno for a burst of extra bite. 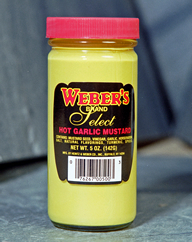 You taste it, it starts out with the flavor of mustard and a minute later you feel the heat build… Great on hamburgers, hot dogs, sandwiches or to spice up any recipe. 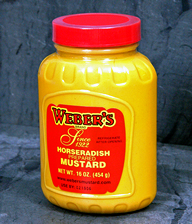 This is the BEST mustard EVER!!!! The only problem is that it’s very hard to find. The only place I have found it is at Camillos Sloan Supermarket. David Thank-you for your comments. Yes Jalapeno Mustard is difficult to find. You will find it at Sloan, Market in the Square, Budweys, Niagara Produce, Hoelscher Meats, Johnny’s Meats, etc- many smaller independent stores. Top’s unfortunately discontinued it a few years ago due to low volume sales. You can also stop into our walk-in store here at 150 Reading during business hours Mondays-Thursdays 7:30-3:00. Again, Thank-you!!! !